The 9th Annual Richmond Kids Expo and Babies Too! will be held next Saturday, February 25th, indoors at the Richmond Raceway Complex from 10am to 4pm. The Richmond Kids’ Expo and Babies too! is the largest event that is designed to provide parents with a fun trade show environment. While spending the day with the kids, parents can shop, and learn about products and services offered at each of the exhibitor’s booths. • Great Products to See & Buy! • Live Entertainment • Contests • Prizes • Games • Meet Mascots • Fun Giveaways • Learn Child Safety • Summer Camp Info • Diaper Dash • Moonwalks • Petting Zoo • Arts/Crafts • Financial Planning • Health & Spinal Screenings • Home Improvements • and much more! Admission is $6 for adults, $3 for kids ages 3-12. You can save $1 on admission by signing up for the email list, or $1 on children’s admission with the Richmond Family Magazine coloring page. We attended for the first time last year (my husband, three-year-old, and me) and had a good time browsing around. My son received a free toy car from RIR at the entrance to the expo, so it was a huge hit with him from the start! This year, stop by and say hi because I will be there! And I have a chance for you to attend for free. Actually 3 chances – Thanks to the Kids Expo, I have three family four packs of Kids Expo tickets to give away! Contest ends Monday, February 20, at 12pm. Three (3) winners will be chosen by Random.org and have 24 hours to respond with their mailing addresses, and will each receive 4 tickets. I love you, you love me… Barney’s coming to town! 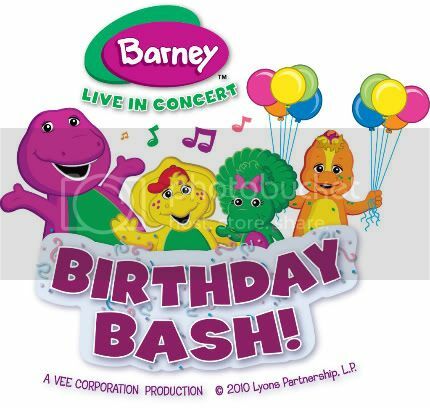 The Barney Live in Concert – Birthday Bash! World Premiere Tour will be performing at the Carpenter Theatre at Richmond CenterStage on Thursday, December 1, 2011. There will be shows at 3:00 pm & 6:30 pm. I have a family 4-pack of tickets to give away! To enter, leave a comment on this post with the title of your favorite Barney song (or the one that drives you least crazy 😉 ). Contest ends November 10 at 11:59 pm EST. Winner will be chosen by random.org and have 48 hours to respond. The winner will be mailed four (4) ticket vouchers to the Richmond show. Celebrate with Barney™ at his birthday party! This BRAND NEW, interactive, live stage concert, features more than 25 fun and upbeat tunes, including favorites such as “Mr. Knickerbocker,” “Dino Dance,” “Baby Bop Hop,” and “Rock ‘n Roll Star” You’ll be singing and dancing in the aisles with your favorite purple dinosaur and his friends Baby Bop™, BJ™ and Riff™. It’s a fun filled show all about sharing, caring and friendship – brought to you by the power of your imagination. office and all Richmond CenterStage or Etix locations. To charge by phone, call 1-800-514-ETIX. • Ticket prices: $16, $22, $28 (Gold Circle), & $54 (Dino Seats). • Group discounts available. Groups 15+ call 804-592-3401. • Get the ultimate fan experience with Dino Seats! Greet photo opportunity with Barney! Save $3 per ticket! Use the code PURPLE online at etix.com to receive the discount.